The album starts with the album entitled song : Eyes Of Darkness, and this songs blows everything away !!! One of Axxis all-time best song, period. What a riff on that song, and of course Bernhard Weiss vocals are absolutely perfect like always. The song is quite moody with it's intro, middle break and ending (chimes bells). The only thing to say against the song is that it's an happy song and that goes in contradiction with it's title, but that's a small detail I'll admit. So a killer of killer songs and for me the song itself is worth getting the album (if you're an Axxis fan that is :)). After the shockwave of the first song I was waiting for an atomic bomb on the second, unfortunately the bomb never came, instead there's a medium-tempo groovy merry tune called Wonderland that is one of Axxis worst song (definitely the worst on the album at least) !!! What the hell does that song do in second position ???? It's not even worth being a bonus track for a Jupiter release of the CD !!! That's really too bad cause the playlist is a very important thing and many bands do the mistake of killing the ascension made by the first (usually the best) song. Let's take two seconds to analyze logically this thing shall we ? You put like your best song then right away you put the worst.... well, I know many people who stops the listening at the shop and put the CD back on the shelves. You MUST make the 3 first track killers if you want to catch a guy's attention, ballads and others at the end, so one can choose to stop the listening when he wants to. What's interesting is that the previous album followed that logic. Then comes a cover song The Four Housemen which apparently is a cover written by a fellow Greek (Vangelis Papthanassiou), but I don't know which band the cover is from and although the song is a good one, it doesn't sound much like Axxis. The fourth song is a ballad, and there I really begin to ask myself what's happening to Axxis here, as this song Brandnew World is absolutely not original for a bit and reminds me some happy ballad like only boys band acts had the balls to release for all MTV chicks to wet their pants. The only things saving the day are again Bernhard vocals, but that's sort of a given now. Thanks goodness a killer track again !!! When The Sun Goes Down blows this crappy songs away and starts with a bass riff reminding me Gene Simmons (KISS) and then a fast paced song with excellent vocals, cool lyrics and awesome vocal performance. Now that's how you guys must write music !!! I believe that if I go on the review is gonna take pages, so I'll go on faster. Fortunately the end of the album is getting better, none of the songs beating the first one but that's normal since it's one of 2001 best song (with The World Will Be Better from Heavenly). There are some good song like Shadows Of Light, Battlefield Of Life, At The Crack Of Dawn and the excellent Larger Than Life. Unfortunately in the end, it all sounds like already done material by Axxis, and some moments will really get the copy-paste feeling. You take Eyes Of Darkness and you instantly feel Living In A World meets Shadowman. Larger Than Life reminds me Why Not ? and almost all songs have this strange feeling of déjà-vu. The digipak version contains a videoclip of Shadowman in MPEG and a game developed apparently only for Axxis called RockMine. It's a 5 minutes funny shooter in 3D, which will remind you Wolfenstein 3D or Doom but without the punch or look of professional games. It's nicely done for a bonus thing, but it doesn't stand a chance to stay installed more than 10 minutes on your hard-drive, anyway it's appreciated to give something original and I'll put up some points for originality here but I would prefer another song like Eyes Of Darkness that 20 of these games. When I really want to play : then I play Quake III or even Starcraft (the best game in the world, ever! ), and in the end the bonus material is maybe more a waste of time or recourses if you ask me. To come back on the music I'd say that after a few listens it still remains a good Axxis album, not rivalising with their 3 first ones, but I'm willing to hope that they'll get back there eventually in the future. I'm a bit mad as for the ballads, what happens to the best ballads from Axxis ? I mean how can a Brandnew World, Angel (this one's okay) or Lost In Love (bonus track) can do against Tears Of The Trees (Kingdom Of The Night), Hold You(Axxis II) or Stay Don't Leave Me & Love Doesn't Know Any Distance (both from The Big Thrill) ? Well, they don't stand a chance if you ask me. I believe that ballads are the biggest weakness of today's Axxis, and when I listen to the fast killer songs I believe it would be wiser to make album with 80% fast songs and one or two good ballads (one on the middle, maybe track 5 or 6, and one closing the album). I'm sorry if I get all emotional in my review from time to time, but this band means a lot to me, really, so I'm hard I know, but it's because I love them so much ! In the end, after a week of listening to this album I quite like it and I think it's a good album, melodic, catchy and despite all the weaknesses and problems I could find, I still think it's much better than Voodoo Vibes (OK that's a cheap shot :) ) or even Matters Of Survival (but not by much !). But it's inferior to Back To The Kingdom, and that worries me a bit. Please guys don't do trend or fashion like you were asked in the past, stay true to yourselves and play metal. And that's what it's all about I think, this album is less metal than the previous one, it's more AOR (and sometimes even Pop), and although that's a style (AOR) I also like : I prefer headbanging on songs like Never Say Never, Little Look Back, No Advice or Rolling Like Thunder since those songs are timeless. 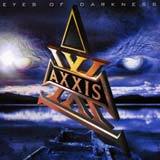 A good album for all fans of Axxis with a couple of excellent songs and some nice tunes then and there, but in the end the song Eyes Of Darkness alone really saves the day !